When we are young our town or village is the whole world. The people behind the counter in the local shops mean something to us, forever recognisable as our parents drag us along on errand after errand. These people are sometimes also our teachers, our carers, our neighbours, and regardless of race or creed, they matter to us because they have shared a role in our childhood, and in a Romantic sense, helped us —however intangibly— to become the people we become. That is not to say they are any better or worse than people we never know, rather that there is something hard to quantify about the effect of local life on us as people. No doubt it varies from person to person, but there is perhaps nothing worse than feeling as though you don’t belong. Our first childhood experiences of a culture (and indeed a world) outside of our immediate surroundings come through stories and fables. Our parents read us fairytales before we go to sleep and we spend our childish nights dreaming of knights, and castles and lost orphans in some quasi-medieval world that is of course always obliquely medieval Europe. We also though learn the stories and myths that characterise our local areas. We learn of the bridges where there are trolls and the cottages that have been empty for years— maybe there is a curse or a witch?— and the people we spend our daily lives with or pass in the street learn to know these things too. This build-up of folklore is just one way in which we develop an identity which we share with those around us. Talk of identity, particularly when it pertains to geography is difficult. As a concept it is just too close to Nationalism, with the accompanying racism and hate. All of these should, it goes without saying, be condemned. However, community identities are something different, and to think of folklore and its spread is one way by which we can understand how they work. In County Durham in the North-East of England, there is a legend called ‘The Lambton Worm’. The Lambton Worm is a worm in the fantastical ‘wyrm’ sense. That is to say it is a dragon of sorts. At the beginning of the tale, it is a tiny thing caught by a fisherman in the River Wear. He soon discards the catch down a well when he becomes convinced that the worm is the devil incarnate, and this man, John Lambton, goes off to war for seven years. During his absence, the worm grows and becomes a threat to both humans and livestock; it is soon a fearsome beast. Then, Lambton returns and discovers the monster he has left his area. Soon, on the advice of a local witch, he sets out to kill the worm, but he is warned that he will have to —for reasons best left to the vagaries of myth and magic— kill the first living creature he sees after that, or else risk the next seven generations of his family being cursed. Of course, his ‘foolproof’ plan to bypass this obligation fails — the dog he was supposed to see first and kill does not materialise— and instead, after despatching the worm, he sets eyes on his father, who he refuses to kill. Then as the years pass, he and his descendants suffer exactly as prophesised. This is a tale particular to a tiny geographical area, and local wisdom suggests it has a concrete source (boringly, in the harsh taxation policy of a real-life John Lambton.) Why have I gone to such lengths to describe it? 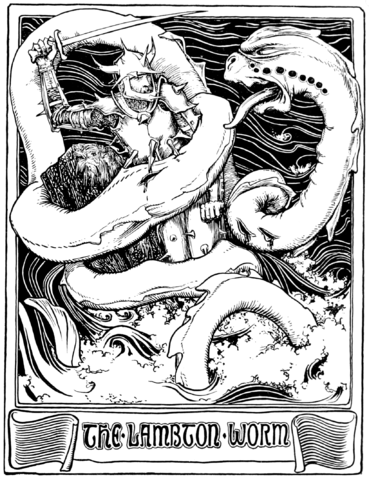 Well, The Lambton Worm is a story that is part of the very fabric of this area of England. Go 30 miles North or 30 miles South and its meaning fades. It, as with much folklore, speaks to the ties which grow upon us if we spend enough time anywhere, if we spend enough time anywhere to feel like we belong. In the Europe, regional decay is an under-discussed topic. Most European countries suffer from this to a greater or lesser extent. Yet, after the recent Brexit Referendum, there were no shortage of think-pieces happy to trumpet the backwards nature of ‘the provinces’ where small-mindedness had dragged the progressive big cities out of the E.U. What this demonstrated was two-fold: Firstly that politicians and commentators in the country had little-to-no idea of how to engage with the fears of a public both physically and emotionally distant from the political centre of London. Secondly, in the worthy and correct condemnation of racism, it is easy to elide over the positive aspects of community, which should be a powerful and inclusive thing— the very opposite of racism. Nationalism tells us that we ought to be scared for the survival of our communities. It is an ideology predicated on the presence of an invader, bringing with them an instability that will destroy your way of life. Nationalism tells us that we ought to be scared for the survival of our communities. It is an ideology predicated on the presence of an invader, bringing with them an instability that will destroy your way of life. Without doubt, this is something to challenge, but to do so without understanding where it grows from is a fool’s errand. This is fundamentally about fear, but it doesn’t have to be so. Rather than drawing on the potential loss of something when ‘outsiders’ arrive, we should dwell instead on the way local tradition and local faces can make people feel welcome. For all that I began by talking about childhood, it is not about where you are from, it is about where you are. The Lambton Worm is a story about the mistakes we make when we judge too quickly or too harshly. It, and folklore more generally, is something to share not something to hoard. We can’t help living in our little bubbles, but we can help others understand them. Then, and only then, can we avoid creating our own evil dragons.